This entry was posted in Web links on October 29, 2006 by Links. 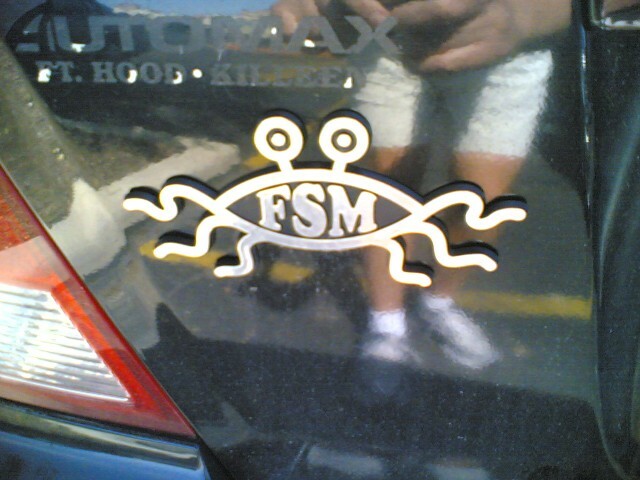 Out at lunch today, I noticed this on a car. We definately need to “Keep Austin Weird!”. This entry was posted in Interesting on October 29, 2006 by Mark. On my bike ride today, I saw that plane again. It was flying around off in the distance. 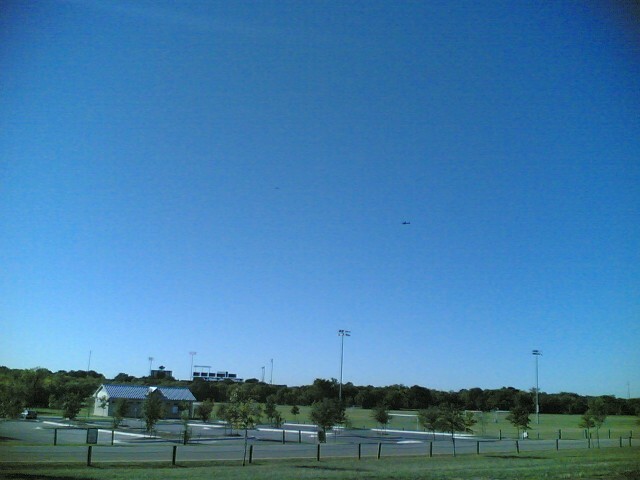 I was really tempted to go home, get my camera, and try to chase the plane down. 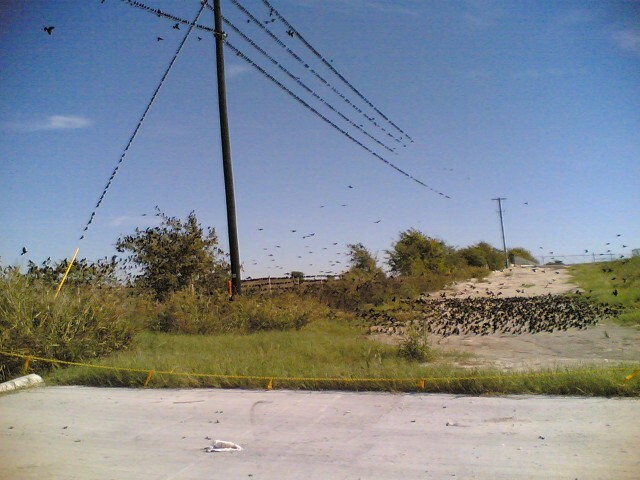 While I was riding down County Road 110 (aka Hutto Road), I saw a huge flock of birds that landed on the road. I was wondering what I would do when I got to them when an oncoming truck got there first and solved that problem. I think that birds have right-of-way. And, plus, if you scare them, you can get pooped on! It was the second time playing the “winter course” variant. I like the new holes. But the whole course is not only comprised of new holes. It uses the original holes. Plus, we don’t do 18 holes. So I think we need to come up with a new course. How about teeing off from the previous hole to the next hole’s goal? We went to Chuy’s for lunch. 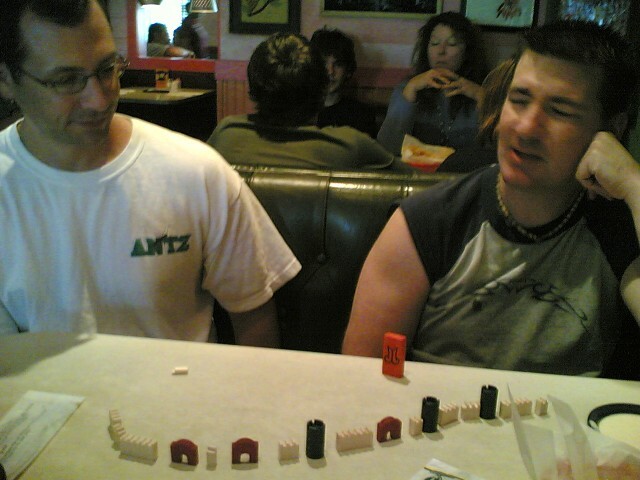 And while we were there, we played a game of die Mauer. It was a bluffing/guessing game. Everyone simultaneously reveals one of seven pieces. If someone else guesses your piece, they get to build. Otherwise you do. An empty fist will place any piece (however, if more than two empty hands are revealed, then no one builds). 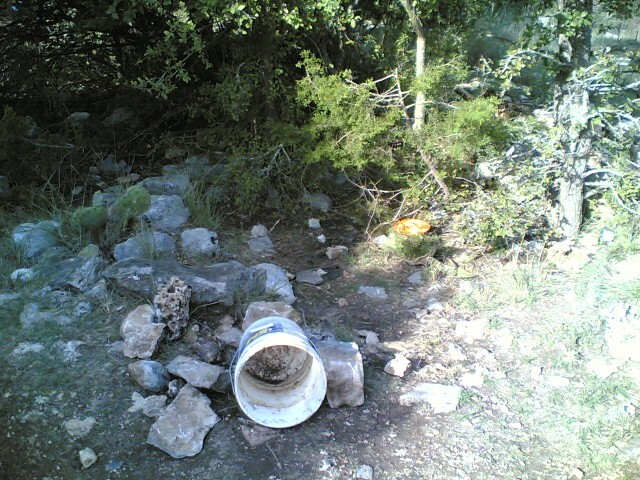 This entry was posted in Disc Golf on October 28, 2006 by Mark. Anyways, so I heat up the grill and cook the ingredients. I get the pizza stone up to 650 degrees Fahrenheit. I flour the peel and flour the bottom of the dough. I put the dough on the peel and then put on the ingredients. But when I put it on the grill, I can’t get it off. That dough is loose, loose, loose. 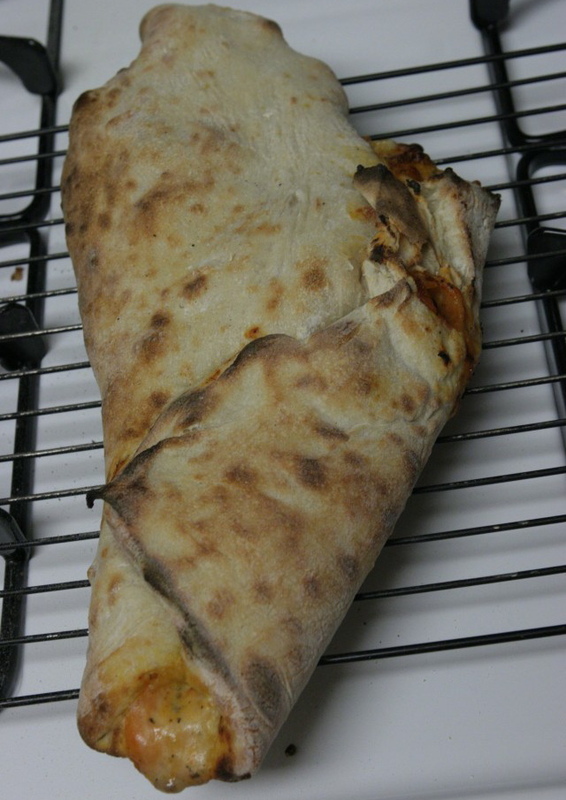 So I turn lemons into lemonaide and turn my disaster into a calzone. It turned out pretty good even when I forgot to cut some vents for the steam. 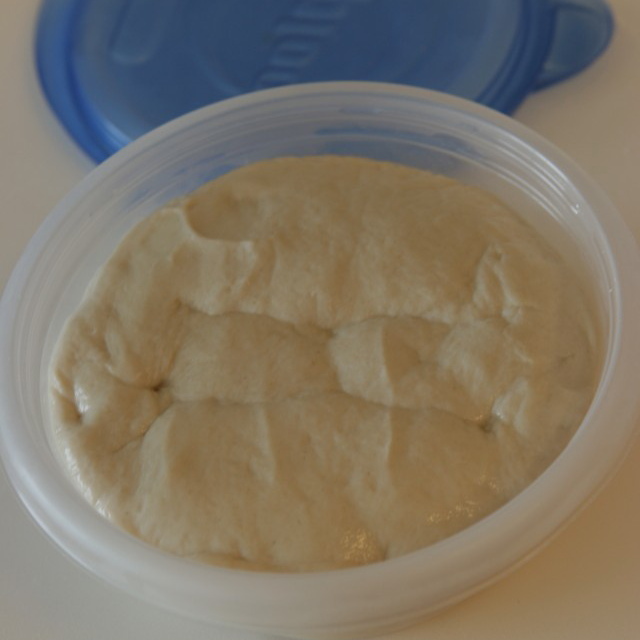 I have one more container of the dough and, tomorrow, I am going to make some bread. This entry was posted in Cooking on October 26, 2006 by Mark. 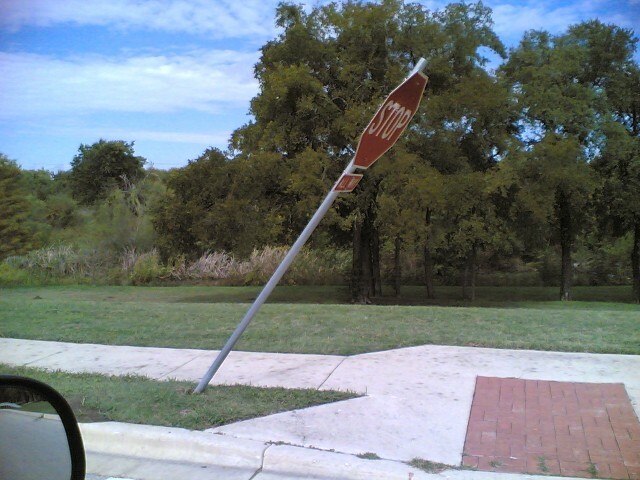 I wonder how long this one is going to remain upright. It was leaning just a little bit recently. But then came the rains and now it is really tipping over. This entry was posted in Interesting on October 26, 2006 by Mark. 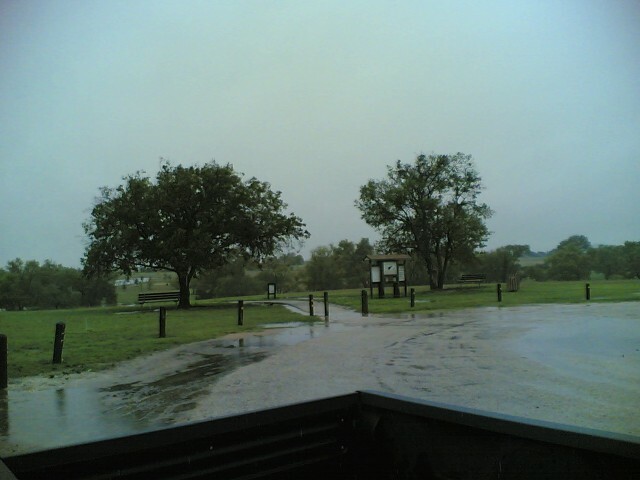 It was rainy out so it was the perfect opportunity for Old Settler’s Park. Some people don’t like to go out in the rain, but I say “why not?”. Its warm out, its not raining that hard, there is no lightning, I am wearing my bathing suit and my rubber sandles, and its close to my house. The additional rules are that any new streams or pools of water are not considered out-of-bounds. I am glad that I went. I had fun. And I had some pretty great throws. On hole 1, my second throw (an arcing anheizer fell within a foot of the basket). On hole 11b, my first throw (also an arcing anheizer) fell within three feet of the basket. I also experimented with an new throw by wrapping my arm around the disc so that when it left my hand it would be spinning more than normal. That throw worked perfectly on hole 9. The second throw landed within a couple feet of the basket after the first normal throw hit a nearby tree. This entry was posted in Disc Golf on October 25, 2006 by Mark. 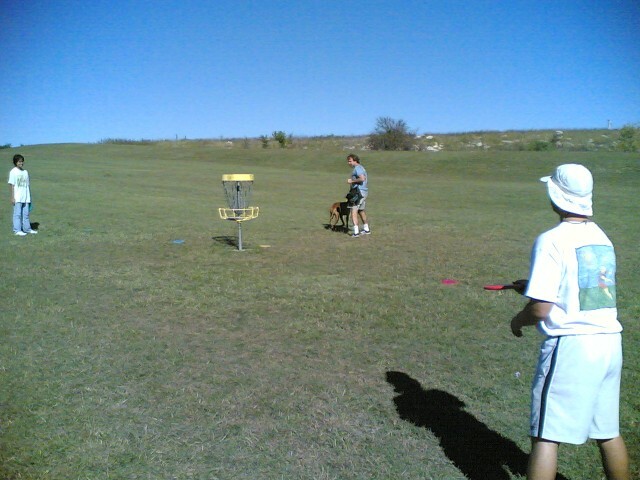 John and I went to Cat Hollow for some disc golf. I arrived early to photograph this. Unfortunately someone stole the basket for hole 13. All that is left now is a bucket. Which is sad since my throw was like right next to it. This entry was posted in Disc Golf on October 23, 2006 by Mark. I went to Duke’s BBQ Smokehouse to try out their breakfast tacos. 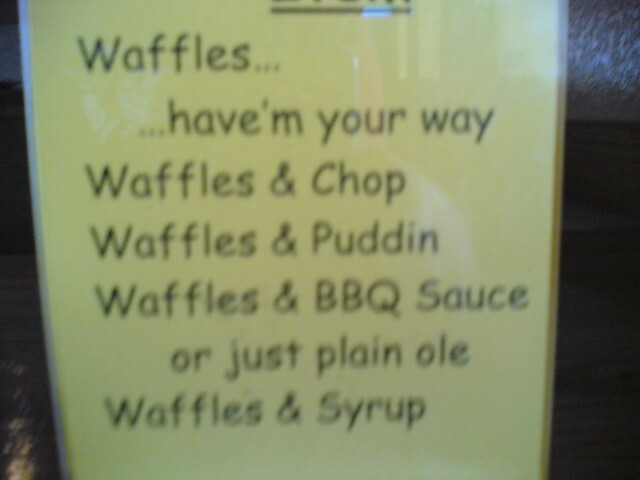 I noticed that they were now offering waffles and I was amused by their choices for accompaniment. I guess that “chop” is chopped beef. But what would “puddin” be? Bread pudding? More likely it would be bananna pudding. “BBQ sauce” is just plain gross. Afterward I went to the Rivery to photograph this. This entry was posted in Interesting on October 23, 2006 by Mark.